...he can make plants grow. 'What sort of superhero is he? ', you might ask. Well...he's a substitute hero. 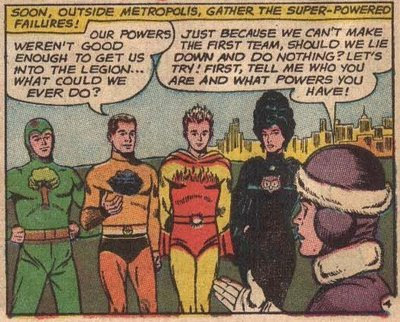 In the far flung 30th century, D.C. Comics had a group of futuristic teens called the Legion of Super Heroes. Young men and women from different planets and each with a peculiar power which was, usually, an ability native to their home world. There was Cosmic Boy, who could control magnetic forces. Saturn Girl, who could read minds. Lightning Lad, who could generate lightning, Phantom Girl, who could sidestep dimensions and walk through walls...etc., etc. Each hero's name went along the lines of "kid", "lass", "lad"....even Superboy (travelling from the past and who had inspired the group to form in the first place) was a member. In order to become a member of the Legion and get access to their cool clubhouse as well as a Flight Ring (which let you fly...duh! ), you have to try out. What happens when you fail your Legion tryout? Why, you form your own group...the Legion of Substitute Heroes! After one particular Legion tryout, a group of rejects consisting of Polar Boy (made things cold), Fire Lad (projected flames), Night Girl (super strength/invulnerability, but only at night), and Stone Boy (could turn to stone, but couldn't move after) got together with Chlorophyll Kid to form their own group. The Legion of Substitute Heroes! Their goal.....support the Legion where they could and help their fellow sentient beings. Chlorophyll Kid didn't have an outstanding run....in any book...but was a fun character who had a lot of potential, I always thought. I also loved the idea of a misfit group that would pinch-hit for the main hero group in times of trouble. The Kid and his pals were fun heroes for a more fun time in comic book history. Tune in tomorrow for "D" and a bit of....magic. Also, since it's the first Wednesday of the month (man, time sure flies by) it's time for another Insecure Writer's Support Group post. The brainchild of uber-author and blogger, Alex J. Cavanaugh, the IWSG is a time for self reflection and to discuss what, as writers, makes us feel insecure. This month, I'm happy to say, I don't have a lot to be insecure about. While I haven't been doing much writing, I have been keeping my blogging "schedule" that I set up back in January. In my case, structure, repetition, and routine are paramount for my writing. Just sitting down to write...regardless of what I'm writing...is a great big step forward for me, and it's something I've been doing pretty diligently. While I want to keep up with my blogging, I'm going to have to transition my routine over to writing my stories and not just blog posts. Slowly, but surely, I think I'll get there. I've never heard of the Substitute heroes, but how cool. Seems like a good way for them to have made kids feel like they didn't have to be perfect or have a bunch of talents, but just one little thing they were good at. Hmm, these guys sound just like the sidekicks in Disney's Sky High (2005). I'm in the same boat trying to balance the writing and blogging scales, but they keep tipping one way or the other. Stone Boy's power is the worst. I'm sorry but if your power makes you unable to move, I don't want it. At least he can survive if something heavy (that doesn't crush stone) falls on him. And Night Girl is a hazard, the villains could just beat any citizen that they think is her in the daytime til they found her. Anyway I think Chlorophyll Kid's power is awesome. The power to make plants grow fast? Wild! He could turn cities into urban jungles. Reading your post gave me an idea for a movie. "They said he was a loser"
"Now he's going to prove them DEAD Wrong"
He holds up his hands and the screen is filled with vines and other plants. Then he looks forward through a tiny patch with eyes filled with hate. So? What do you think of my idea Mark? And cool post today, definitely perked me and my 'idea center' up. Didn't know about The Legion of Substitute Heroes or their members til today. Chlorophyll kid, it does sound kind of funny! An interesting character though. Having a league of substitute heroes is pretty cute. I'm here from A to Z. Thanks for stopping by my blog. Love the costume on that guy. LOL! Oh, man, it just keeps getting better. My sides are going to be in pain this whole month from laughing! Thanks, Mark! Hi-- cohosting with Alex this month for IWSG-- great post, both the C and the IWSG. Glad you're not feeling insecure. And yes, balancing blogging with our true pursuit, writing, is key. Chlorophyll Kid? never heard of it, but I like the concept. He could end world hunger! I think it's interesting that the Substitute gang doesn't seem jealous or resentful of the A-Team. This is a riot. I had never heard of Substitute heroes. Always thought it was funny that the Legion of Superheroes' club ring gave you a better power than half of them brought to the table. Though honestly, his powers could reverse a planet's world hunger issues. A god among desertification! he is awesome... i would like to have that power, everything i grow dies... back up super heroes... brilliant. Could I borrow him to countermand my anti-hero...Black Thumb Girl? Just sitting down to write regardless of what I write is my current motto too. Finally managed to follow you. @Jenn: Heh, yeah Sky High was very cool..great movie and there are quite a few similarities, yes! @J.: Ain't that the truth! @Sheena: LOL...love it! That's great and could totally see Hollywood giving CK that sort of treatment :) I think, a couple of times, they used Stone Boy as a battering ram or dropped him on unsuspecting villains. What a way to make a living! @Jolie: Haha, I know...pretty snazzy, huh? @Julie: Hey there and thank you very much. It's a tough balancing act, for sure! @Nickie: Well, I think they had a twinge of jealousy, but also wanted to do good, so they put it aside. @Rachna: It can certainly be tough and thank you! 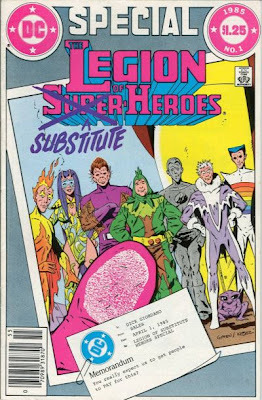 The Legion of Substitute Heroes - that reminds me of Sky High, a Disney movie my family loves, in which one of the characters (a girl in this case) can grow plants . . . and although her power is considered strong enough to put her in the superhero group at Sky High, she chooses to be with the less powerful sidekicks instead because she doesn't like the system. Love the fact that both your B and C posts are plant related. Curious to see how many more end up being so. ISWG - Must agree, blogging is the best. However, it does take a large chunk of time that can (and should) be devoted to other writing areas. Balance is so important...nice post. I have a character in my first novel who can grow foliage... But she is suit the force to be reckoned with... Lol. Chlorophyll Kid looks kind of nerdy. I guess even nerds need a super hero they can relate to! Mark, I need that guy/superhero substitute...to come over and make some of my plants grow...lol! Great post! I'm so glad you're in a good place this month!!!! Keep rockin' it! And good luck with your writing! I know what you mean about writing vs. blogging, I'm definitely going to switch more into writing mode once the Challenge is over. Chlorophyll kid? Seriously? Of course who am I to talk. My super power is something in the line of changing diapers and I wouldn't even make the substitute heroes. We all need subs once in a while, so why no heroes? Great idea. I guess Chlorophyll Kid is out of fashion these days--too smaltzy? Too bad. He's the kind of hero I can relate to. If he could have used his growth powers for humans, he could have made a killing in the ED business. That is awesome you stick your blogging schedule. Those consistency skills will come in handy with the transition over to writing. Chlorophyll Kid looks like Oliver Hardy sans moustache. That's a really unique superpower to have. Yes! The Legion of Substitute Heroes! I loved reading those stories. Infectious Lass was always one of my favoites, Chlorophyll Kid was a close second. I'll be covering some legionaries too in the coming days! 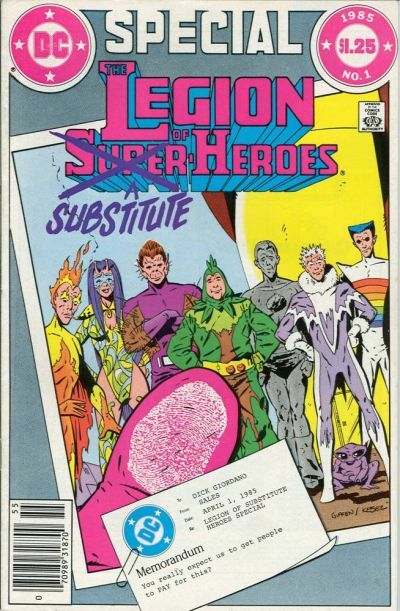 Kid Quantum and Matter-Eater lad, but they were inducted into the original Legion. I am really learning a lot about comic book subculture thanks to you. I suppose that even the Superheroes need Pinch Hitters now and then. Neat post! Glad to hear your writing is going well. I'm new to blogging, but already I see it's great to have support to keep going. Knowing how I kill plants, this guy would certainly be an asset to me. That is a unique super power, if plant growth was instantaneous. God the Substitute Heroes! Stopping by from the #atozchallenge ! They could also call him "Flora" since plants are his power. Reminds me a bit of one of my own characters. Substitute superheroes! I love it! @Lisa: Oh, I remember Elfquest. I never read it, myself, but have heard nothing but great things about it. I should try to get a hold of one of the graphic novels to see what I'm missing! @Sherry: LOL...yeah, he looks pretty nerdy, for sure! @S.P: Hey, don't sell your power short...I'm sure it's one many men would envy. I know I would. @Lee: Me too. I always identified more with the underdog than the rockstar. @Amanda: You know, it took me a second to realize what "ED" was...then I thought about it....haha! @Laeli: Hey there, thanks for stopping by and hope you're keeping warm up there! @M.R. : Thank you and I hope so! @nutschell: Glad you enjoyed it. They were a pretty fun group to read about. @Robin: Yep nerdiness abounds here :D Glad you're enjoying! @Lucy: Thank you and good support can make all the difference. @Melissa: Sometimes getting structure isn't that hard...it's sticking to it that can be tough! Chlorophyll kid? Really? The name sounds so lame, hahaha. Reminds me of The Tick series. They were all lame but they were sooooooo funny. I wish I had the power to make plants grow. Everything I touch dies. Exhibit: dead aloe plant sitting on my kitchen table right now. IN-credible. I don't believe your ability to fine these arcane and cool 60's comic book superheros. I love this one in particular because I am...a vegetarian. Sending this to my comic book freak son again! You are the best! Seeing the Chlorophyll Kid makes me green with envy. That might be a good thing. And writing is a question of balance that suits you. Writing without pressure is how I write. Be well, I'm going now. @Al: Haha...yeah, lame name, but sort of cool power :) Best wishes in your writing and I hope to be doing it right along with you. @Gary: Green with envy.....groan! You're cracking me up here :) I agree..writing without pressure is the best way. Take care, my friend. really fun post. Glad I dropped by. Be back! It was a well-deserved shout-out! Blogging does take a lot of time. Trust me. Substitute heroes. I love it. I guess if you have to be second at something, why not being a super hero. I am enjoying this theme a lot. Way too cool. Stone Boy, huh? That literally sounds like the worst superhero ever. haha. Clorophyll Kid, who knew? I bet he was fun and maybe a little grumpy, judging his sour expression, lol. Just stopping by from the a-z challenge. I realize this isn't on your a-z post, but... I have to agree that it's hard to find a balance between keeping up with blogging and your writing. For me, it seems if I put a lot of attention into one, the other one gets left in the corner. And then you have to add reading, and critiquing, and real life on top of all that, wow, life as a writer is exhausting. I would gladly take a substitute hero in lieu of...none....love the post and the sad-sack picture of Chlorophyll Kid. He looks a wee bit like Lou Costello. love your obscure comic trivia! Chlorophyll Kid?? I thought you must be joking. How funny. Re disciplined blogging and writing schedule - I sooo wish I could do that. My writing/blogging is so random. Laughed at the 'substitute hero' but making things grow is a cool gift just not as flashy as other 'hero' talents. Maybe Superboy should have been really good with his superannuation. hehe. Seriously, these guys sound cool and I like the quirkiness of these unusual powers. @Jessica: A lot more work than most would think! @Claire: Mine used to be very random...too random, actually. A schedule helps a bit, though. Wow, we never heard of him before and we love comics. Definitely thinking sidekicks but he can come help us keep our plants and gardens alive. Heroes are heroes... in any form. Substitute or not... we need all the heroes we can get! And I like the fact that Chlorophyll Kid has a simple power... well, it seems simple by today's standards! Not like the fancy shmancy "high-tech" powers of todays comic heroes. Well done for keeping to a blog schedule - I tried it for a while, and couldn't do it. I'm sure you'll get some fiction writing done soon! That's about where I'm at, too, Mark. Life issues are taking time and causing discord, illness is keeping me down, and my writing is suffering. I left a good response at Father Dragon's, if you want to check it out. Loved your GI Joe on the other blog. That's the kind I used to have. Of course, he had been through hell, fires, and war! I had to do a double take when I saw the title. Srsly, Chlorophyll Kid? I am amused, however. What an odd and interesting character and group of superheros. Thanks for sharing.